E-Learning has first come to us as a method to learn content. In reality, e-Learning is a technology that enables communication, between a broadcaster and a receiver. In a learning context, the broadcaster is the content provider or the trainer, whereas the recipient is the learner. Adult learning typically requires individuals to get involved. The technology provides for the possibility to adapt the course of learning to the responses provided by the learner. Yet it also provides a great platform to capture responses and reactions from learner communities to improve their learning experience and the final effect it has on the business. E-Learning production covers any subject, not just those contents in which ATC specialises. E-Learning technology is a communication technology that enables learning, but can be used, and is used to spread strategic messages throughout organisations unaltered, whereby timing can be controlled. The typical cascaded communication structures of larger organisations change the management messages as the cascade goes on, down to the bottom of the organisation, not only changing the message, but also potentially missing its target. In an education environment, e-Learning can sometimes be the entire solution, in many cases it is a part of a larger solution. It has the advantage to be more flexible as people run their e-Learning courses when it fits their schedule. One can also adapt the speed of execution to their own level. Today’s technology provides many ways to question and test learners using images, voice and text. All this can be managed centrally, so you keep track of who did what and when. You see what questions are most difficult (time it took to respond, or level of errors). You can adapt your reports or ask us to do so. You can also track results over time. Title: How do we see? A look at the retina and the photoreceptors. This is a sample eLearning to show you how eLearning works. 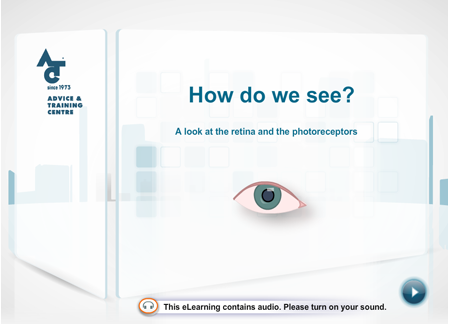 The topic in this example is part of an eLearning explaining the eye, more specifically the retina. To complete this eLearning module, you will require about 15-30 minutes. The module opens in a new window. However, there are subject matters that are difficult or impossible to cover by normal e-earning methodologies. Those situations typically require a lot of interaction, for which eL has an equivalent, which is serious gaming. The development cost of serious games is such that other methods are typically more economical.